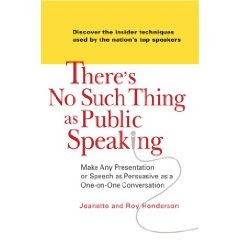 Whether addressing a few colleagues or a packed auditorium, readers will find practical and simple techniques for inspiring every listener. It's a wonderful blend of solid concepts, practical applications, and invaluable techniques. It takes the speaker from the planning stage through to the execution stage of any presentation. It addresses not only speaking in front of a crowd, but also one on one and small group interactions. The whole point of public speaking is to give your audience something to take with them. Rather it be something of entertainment, something of persuasion, and even just some new and interesting facts. You will want your audience members to be able to say that they learned something or that they don’t waste their time listening to you. You will find that it can be hard to break through and audience, but you will want to use your emotions to convince them that they are getting something out of the time that they are spending with you.You will need to use different tools in working the system. One of the best tools to use is humour. It’s very important that your speech have an intrinsic rhythm or “flow”; otherwise, it may come across to listeners as staccato, dull and/or uninspiring. But how do you ensure that your next presentation has a natural cadence that adds to the clarity and energy of the information being conveyed? Though some people do have a natural gift for writing and delivering speeches that keep audience members spellbound from beginning to end, it’s absolutely fine if you didn’t receive that talent at birth. The ability to create a “flowing” presentation can be learned, and it’s probably much easier than you think. Out of all the things I do these days it is SPEAKING that gets me "off" more then anything else. Gary Vaynerchuk has captured national attention as a businessman and Internet celebrity. Gary’s fame can be attributed to his pioneering, multi-faceted approach to personal branding and business building. Which do you fear most? And which fear is irrational? Seems everyone has a different answer. What's yours? Delivering an effective presentation is difficult. With the Internet, listeners have access to more information that ever before and have higher expectations for content from speakers today. In addition, because most people are saturated with entertainment, audiences want a presentation that is entertaining. Read the guide here ... It's basic but comprehensive and sometimes we need a reminder to pay attention to a particular aspect of our presentations. Develop confidence in public speaking - overcome the nerves! Take the assessments, use the techniques to control your nerves and present with confidence. Christina Baldwin’s work on Story…the art, the practice, the importance of telling and re-telling stories in our lives is a stunning masterpiece. Woven beautifully with fragments and selections of her own stories, Baldwin once again instructs, enchants and inspires the reader about the critical nature and importance of the individual stories of all of us. Whether it’s to build community, heal generational wounds, create stronger organizations, leave a legacy, or simply to pass on information, Baldwin’s narrative builds a compelling case for the power of “storycatching.” A magnificent read…and a wonderful gift to give. What will be the questions you carry to ask of yourself and others? A must-have!! Step-by-step Guides That Walk You Through Everything You Need to Know to Create Your Own Inspirational Speech! ... Best man speeches: Be Fearless, Funny and Flawless! ... Bride speeches: Beautiful Words for a Beautiful Occasion! ... Father of the bride speeches: How to be Witty and Well Prepared! ... Groom Speeches: Say the Right Words at the Right Time! ... Maid of honor speeches: Your Complete 'How to' Guide! ... Mother of the bride speeches: Words of Love!